What happened to Catherine Winters? Home › LOCAL › SouthWest › What happened to Catherine Winters? 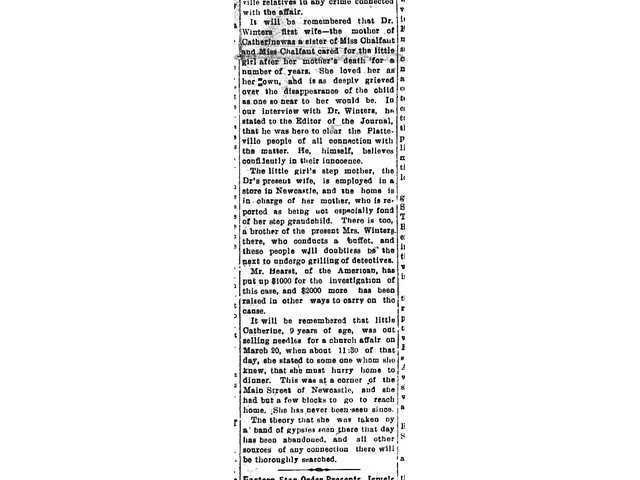 POSTED March 19, 2013 12:09 p.m.
Today is the 100th anniversary of one of the more infamous unsolved crimes in the history of Indiana, which has a Platteville connection. On March 20, 1913, 9-year-old Catherine Winters disappeared while selling sewing needles door-to-door in New Castle, Ind. Despite one of the first large-scale publicity efforts that even included a nationally distributed newsreel, Catherine was never seen in public again. Despite numerous potential suspects, including her father and stepmother, and her grandmother and unmarried aunt — who lived briefly in Platteville — no one was ever convicted of kidnapping or killing her. Catherine’s story is chronicled in a new book written by first-time author Colleen Steffen that tries to answer the question in its title — Where Is Catherine Winters? Steffens describes Catherine’s disappearance as “like JonBenet Ramsey or Caylee Anthony,” an infamous crime without resolution. That, and a silent film that can be seen on YouTube at www.youtube.com/watch?v=AgHuktDokzo. Catherine’s mother, Etta Whistler (spelled “Whisler” in some accounts), a native of Arlington, married dentist William Winters in 1903. The couple moved from Chicago to New Castle in 1904 before their daughter, Catherine, was born. Two years later, their son Frankie was born. Etta Winters died in a sanitarium in Colorado Springs in 1909 of tuberculosis. After Etta’s death, Etta’s mother, Eliza, and half-sister from her mother’s first marriage, Ida Chalfant, came from Platteville to New Castle to take care of Catherine and Frankie. One year later, Catherine’s father married Byrd Ritter in Indianapolis. About a year after that, in 1911, Eliza Whistler and Chalfant returned to Platteville after Byrd Winters sued them for room and board. “There was a lot of animosity between the stepmother and the in-laws,” said Steffen. Catherine Winters was selling sewing needles door to door to raise money for a church missionary society on March 20. At one point, she walked past her father’s dental office. Sometime during that day, Catherine was kidnapped. She was never found, despite her father’s strenuous efforts to find her. “At first a lot of people think they saw a kidnapped kid, even though [Eliza] was elderly and ill at the time,” said Steffen. Then, on July 16, The Journal repeated a Galena Gazette report on a search near Dodgeville after a train conductor on a walk stumbled upon a gypsy camp whose members “act strangely” and had a group of young girls with them. The Journal also reported an appeal to the Knights of Pythias, a fraternal organization that had a lodge in New Castle. “The prevailing theory around here is her father did it, her stepmother did it, and the one-armed telegraph operator that was boarding in their home,” said Steffen. On May 29, 1914, W.R. Cooper, the telegraph operator, was arrested after a child-size red sweater was found in the Winters’ basement while they were out of town with the newsreel. William and Byrd Winters were arrested May 30, 1914, and charged with conspiracy to commit murder. Prosecutors devised a theory that Cooper and Byrd Winters had an affair and killed Catherine when she found out about it, and that William Winters helped them cover it up. But neither Winters nor Cooper were ever put on trial. The day the trial was to begin, charges were dropped. Steffen’s theory ties Catherine’s disappearance to two other incidents, in which an 8-year-old girl was abducted, driven out of New Castle in a rented buggy, assaulted and then set free six days before Catherine’s disappearance, and an attempted kidnapping of another 8-year-old girl outside a New Castle grocery store six weeks after Catherine’s disappearance. William Winters died in 1940. His last words were, “Now I’ll find out what happened to Catherine.” Byrd Winters died in 1953. Steffen’s blog at www.whereiscatherinewinters.com notes that on today’s anniversary she will be going to the New Castle cemetery. “It’s a sad fact of Catherine’s story that if she hadn’t disappeared in 1913, she would never be thought of in 2013,” wrote Steffen on her blog. “Her tragedy made her famous in her time, and the failure of her family and town to find her keep her remembered in ours, to the poor extent she is remembered. For Catherine, happier outcomes would have meant oblivion in an entirely different way.